This unique design will make a statement! We've combined long-lasting Phaleonopsis orchids and succulents with roses and rich purple hydrangea that pull it all together. This one will surely add artistic sophistication to any occasion. 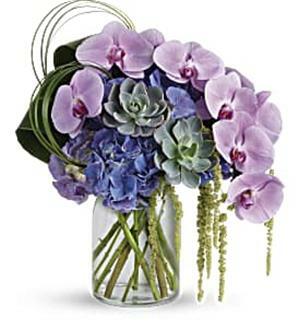 This eye-catching bouquet features purple hydrangea, lavender phalaenopsis spray orchids, hanging green amaranthus, bear grass, green ti leaves, and large green echeveria succulents. Delivered in a clear milk jug vase. Approximately 15 1/2&amp;amp;quot; W x 17 1/2&amp;amp;quot; H .Flowers and container used subject to availability and season. Some substitutes may be necessary.